When you want to lose weight or simply maintain it, you may think eliminating fat from your diet will make the magic happen, but it doesn’t work that way. There’s plenty that goes into getting in shape and living a healthier lifestyle, but eliminating fat completely is not one of them. The truth is your body needs fat. In fact, one of the hottest diets right now, the ketogenic diet, relies mainly on fat. When keto dieting, most of your food intake comes from fat with about 20g of protein and less than 5g of carbs. These specific macros allow you to force your body into ketosis, a metabolic state in which fat is used as energy instead of being stored. During the first few weeks of a ketogenic diet, many people feel sluggish due to the fact that they’re eating less carbs and the body needs to adjust to not having its go-to energy source. That’s why pre-workout supplements like BEST PRE WORKOUT™ are key since it allows you to keep training at a high intensity, all while providing you with the fuel you need to power through. Fatty acids give you softer skin, protect your organs, produce important hormones, support cell growth, keep your body warm, encourage absorption of nutrients and vitamins and are a great source of energy. But not all fat is created equal; some sources are better than others. Unsaturated fats are also known as the good fats, including both monounsaturated and polyunsaturated fats. A diet rich in these types of fats can improve blood cholesterol levels and lower your risk of heart disease, especially omega-3 fatty acids. These can be found in fatty fish like salmon, herring, sardines, trout, catfish, mackerel, anchovies and oysters. Unsaturated fats can also help you control blood sugar and insulin levels. Typically, the monounsaturated fats solidify when refrigerated and are a great source of vitamin E. Olives, avocados, hazelnuts, almonds, sesame seeds and canola oil are all considered heart-healthy. Omega-3s, a polyunsaturated fat are crucial to cognitive function and emotional health. This good fat can come from fish sources (as mentioned above), walnuts, flaxseed or vegetables such as seaweed, Brussel sprouts, spinach, parsley and kale. Saturated fats and trans fat (or trans fatty acids) are the ones to stay away from, or eat sparingly. These bad boys can raise cholesterol levels, clog arteries and increase the risk of heart disease or stroke. Saturated fats are found in animal products like high-fat dairy (butter, ice cream and cheese), meats (fatty beef, lamb and pork), poultry skin, eggs and lard. There’s even evidence that these can increase the risk of colon and prostate cancer. When it comes to trans fats, there are two types: the naturally-occurring ones and the artificial kind found in commercially-baked goods (muffins, pizza dough and cookies), icings, packaged snacks, microwaved popcorn, margarine, fried foods (chicken nuggets, breaded fish and French fries) or anything labeled partially hydrogenated. Stay on top of your macros by taking the time to read your nutritional facts labels. 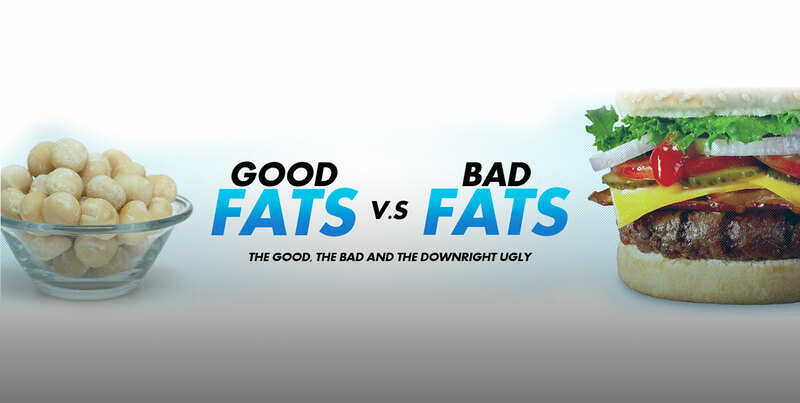 Look for foods that are low in bad fats: the saturated and trans fat kind. Make sure to go for whole foods most of the time, replacing processed foods with the real kind. When eating out, stay away from the fried foods and desserts. You can also ask your waiter how your food is cooked to find out what type of oil the restaurant is using. Order the dressing on the side and opt for olive oil when you can.